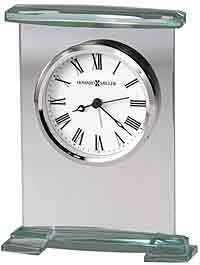 This smaller Worldtime clock will fit on any desk area. This satin silver-tone finished world time alarm clock features an 8-digit calculator. 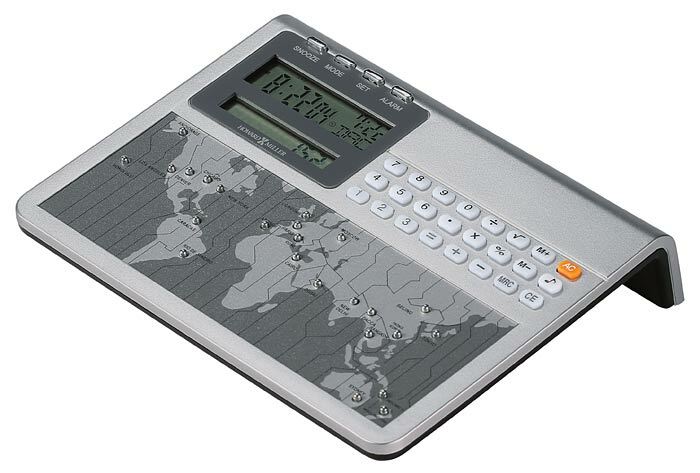 Push one of the buttons on the gray and silver-tone world map to display the time for a specific area. Option to display time for 24 major cities in 22 times zones. The display shows time or month, date, year and day of the week with the push of a button. Includes snooze alarm. Quartz, alarm movement, includes one AAA sized battery. 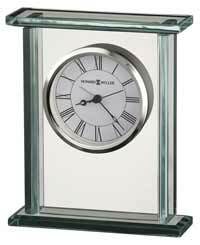 Size: Height 1.25" Width 6.25" Depth 5"
Clocks for sale at The Clock Depot including the 645-761 at discount prices.